View More In Grill Thermometers. The only way to truly know if the food on your grill is ready to eat is by checking its internal temperature. 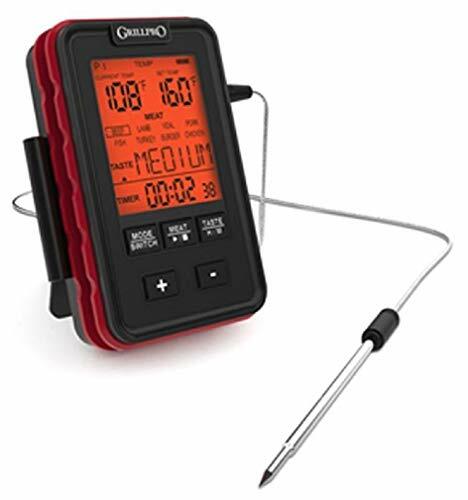 This thermometer is designed to sit conveniently on your grill side shelf to provide you with a continuous read-out of the internal temperature of your food. The thermometer is pre-programmed with a range of doneness temperatures for a variety of meats to ensure a perfect cook every time. The thermometer features a large backlit display allowing you to easily read the temperature even at night. If you have any questions about this product by GrillPro, contact us by completing and submitting the form below. If you are looking for a specif part number, please include it with your message.